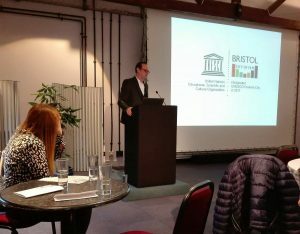 Bradford was represented at the official launch of Bristol UNESCO City of Film on 1 February at the Watershed in Bristol. David Wilson, Director of Bradford UNESCO City of Film was invited to speak at the event to talk to stakeholders about Bradford’s experience. David Said; it was great to visit Bristol again and to speak with the people behind the successful bid. We look forward to sharing good practice and working together with Bristol in the future. Bristol is home to world-leading media. Aardman Animations set up studios in Bristol in 1976, finding fame with Wallace and Gromit, Chicken Run, Shaun the Sheep, and more recently Early Man, which opened in UK cinemas on 26 January 2018. BBC Bristol produces globally recognised radio, drama, factual and wildlife television, and the city is home to the largest production facility in the West of England, The Bottle Yard Studios, whose productions include Poldark, Broadchurch, and Wolf Hall. BBC Bristol also houses the globally significant Natural History Unit, spawning ‘Green Hollywood’, the world’s largest concentration of firms producing wildlife content. 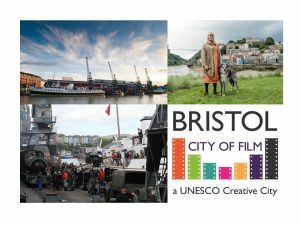 With 11 community-driven international festivals dedicated to film annually, 10 cinemas, and two major universities (University of the West of England and University of Bristol) providing 28 film related degrees, Bristol will play a central role in this global network of like-minded cities.